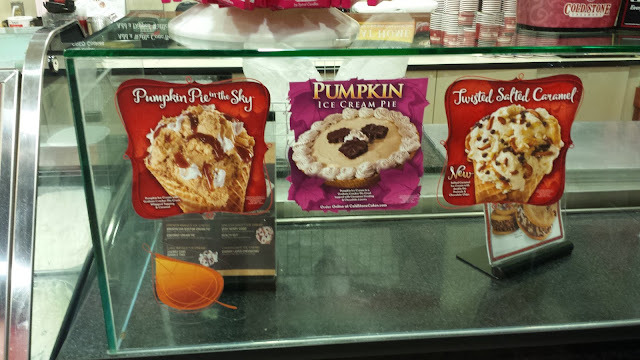 Cold Stone Creamery Celebrates Fall With Sugar & Spice! Are you looking to change up Thanksgiving up this year and upgrade the ole' Pumpkin Pie? 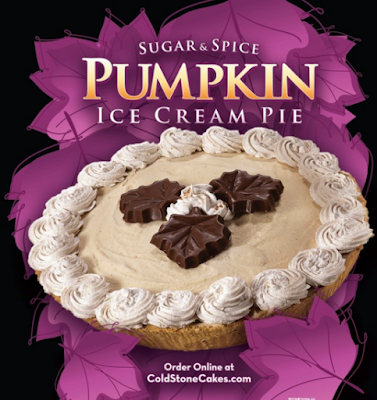 This year, spice up your dessert or Thanksgiving table with a Cold Stone Creamery pumpkin ice cream pie! They heap fresh pumpkin ice cream into a graham cracker pie crust and top it with cinnamon frosting and chocolate leaves. It can be purchased from http://coldstonecakes.com and picked up at your local Cold Stone store! Cold Stone Creamery is also serving up a delicious Twisted Salted Caramel™ Creation™ featuring salted caramel ice cream, double the pretzels and chocolate chips, and welcoming back Pumpkin Pie in the Sky™, featuring pumpkin ice cream, graham cracker pie crust, whipped topping and caramel. Not only will salted caramel be featured in an ice cream creation, but they also launched an extension to new Frappé line with their seasonal Salted Caramel Frappé. My husband and I got a chance to try out some of these fall treats and we LOVED Them! 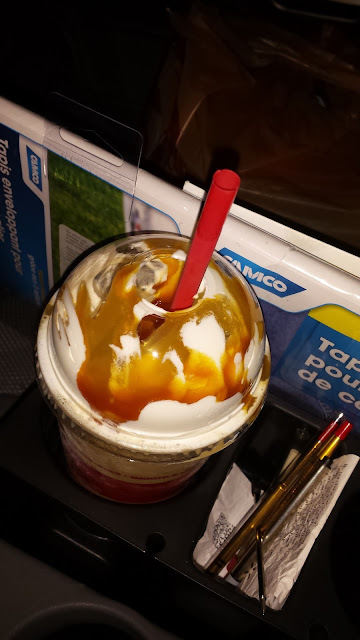 My husband's favorite was the Salted Caramel Frappe and I LOVED the Twisted Caramel Creation! So indulgent and perfect for fall! The Fall Favorites, Pumpkin Ice Cream Pie and Salted Caramel Frappé are only in stores until November 26, 2015!